Universalism, utopianism, utilitarianism… With so many "isms” floating around waiting to blow up our ship, is it safe to go anywhere? How do we navigate through such dangerous waters? In the heart of the Civil War, Mobile Bay was heavily mined (at the time, tethered naval mines were called “torpedoes”). Admiral Farragut commanded his fleet to charge the bay. When one of his ships was hit, other ships began to retreat from the battle. "Damn the torpedoes!" Farragut shouted. "Four bells. Captain Drayton, go ahead! Jouett, full speed!" Yes, destructive philosophies are all around us. We have bought into some of those philosophies whether we know it or not. But do we just sit around and do nothing? No. The best thing is to move forward rather than retreat in fear. In my opinion, it is far better to live for the truth than it is to try to hide from the lies. With the Holy Spirit in us, and with the Word of God in front of us, the lies can be exposed before they cause damage. But a life wasted cowering in fear? That's just a wasted life. God has given us such simple and powerful instruction for living in grace and freedom. In response to the lies, we are to aggressively live for truth! with ten thousand rivers of oil? Yes, we need to adhere to the MINDsweeper principle by taking every thought captive. Then it's time to just get on with it! Full speed ahead! Heavenly Father, I thank You again for the truth of Your Word! I thank You for the power of Your Holy Spirit within me. I thank You that I have been crucified with Christ and He now lives in me. I ask that You continue to reveal the lies that lurk beneath the surface of my thoughts. You have shown me what is good and what is required. I submit to the power of Your Holy Spirit in me right now, and I ask that He would live through me the kind of life that You have called me to today. Amen. 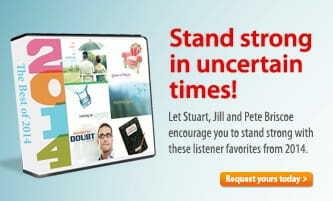 Stand Strong in These Uncertain Times! More than ever, people today are searching for hope, purpose, and significance. And in 2014, Stuart, Jill, and Pete addressed many of these matters head-on in some very popular messages. We want to send 6 of them to you in our Best of 2014 series. This 6-message series is our special Christmas gift to thank you for your donation below to help Telling the Truth reach our $530,000 year-end goal. So thank you for giving, knowing your donation will be doubled by a year-end Matching Grant. Together, we’ll help even more people experience Life in 2015!